No time to bake an entire cheesecake? 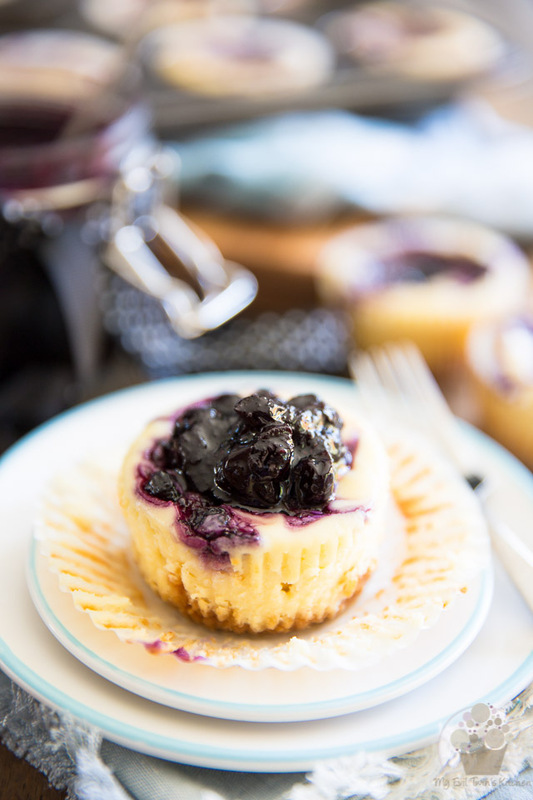 These Mini Blueberry Cheesecakes are super easy AND quick to make and are every bit as delicious as the real thing! Say you’re in the mood for cheesecake but there’s no time (or no patience) to bake a full-on, full-size cheesecake and then wait for it to chill completely before to serve it. 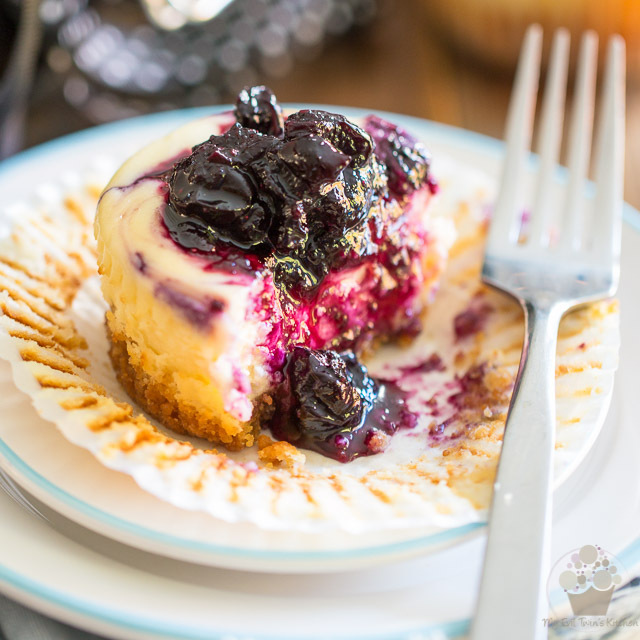 You want to eat cheesecake and you want it NOW! 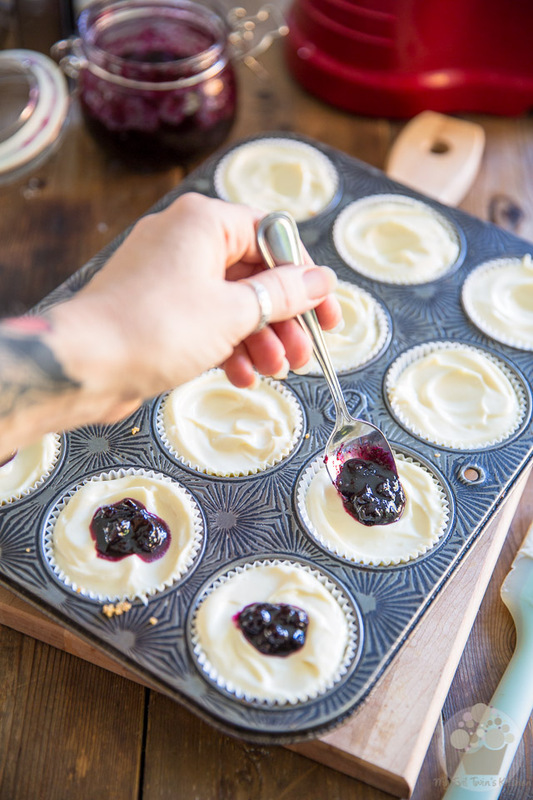 Well, then, please allow me to introduce you to your new best friends: Mini Blueberry Cheesecakes. These little guys will be ready for you in less than 4 hours. Okay, technically, that’s not exactly what we could call NOW, but still… Deliciously smooth, velvety, creamy, tangy cheesecake, made entirely from scratch, ready in less than 4 hours? I say that’s pretty darn good! What’s best is they are SUPER easy to prepare. 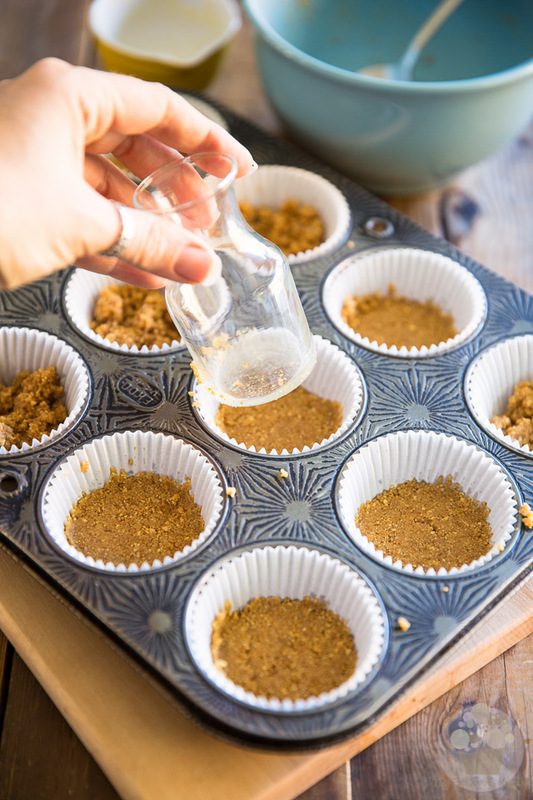 To make the crust, all you need to do is mix some graham cracker crumbs, sugar and melted butter and then press that down into paper line muffin cups. And if you wanted to save even more time, you could very well use round sandwich-type cookies, such as golden Oreos for instance, in lieu of that graham cracker crust. But being a huge fan of graham crackers myself, I wouldn’t dream of making that substitution. Especially since it only takes seconds to make. 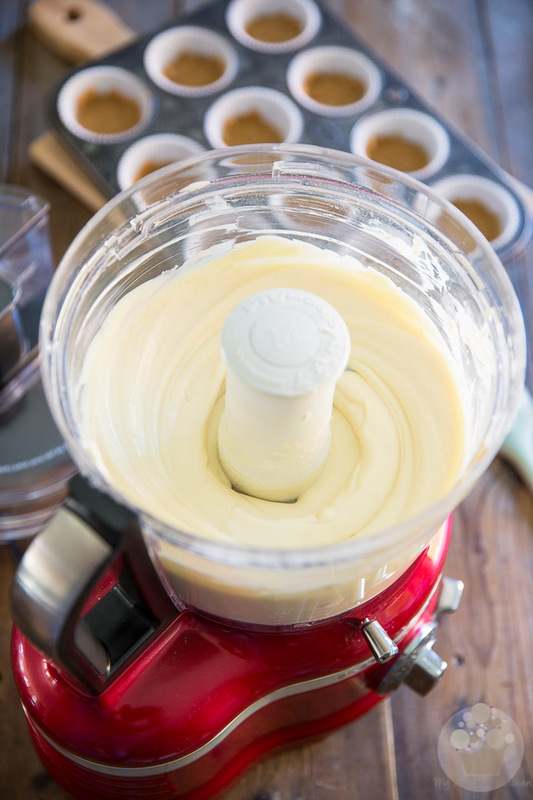 Then to make the cheese filling, you simply mix all the ingredients together in a food processor. No need to get the ingredients out of the fridge hours in advance, either! You can use every single of them straight out of the ice box! All that’s left to do is bake the cakes for 20 minutes (you read that one right, 20 minutes are all it takes!) and then, for the hardest part, let them cool for 3 hours. 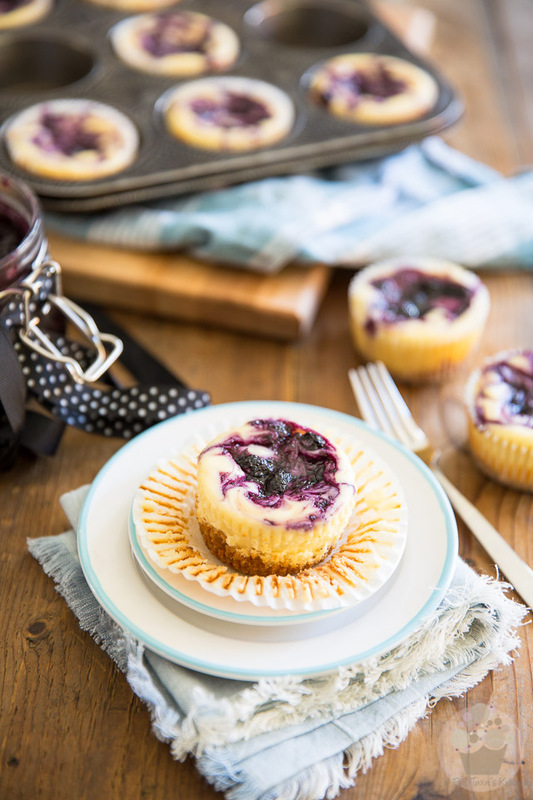 The resulting mini cheesecakes are absolutely spectacular and have absolutely nothing to envy to those high-end, top-of-the-line, full-size cheesecakes of this world. 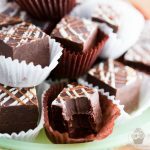 Plus, they’re just the perfect size for a reasonable dessert (or maybe an indulgent afternoon snack), and they’re so easy to carry around, they’re perfect for the lunch box, social gatherings or pot luck parties. Seriously. I wasn’t kidding when I said that they were going to become your new best friends! Preheat oven to 350°F. In a mixing bowl, combine the graham cracker crumbs and sugar and then pour in the melted butter; stir until well combined. 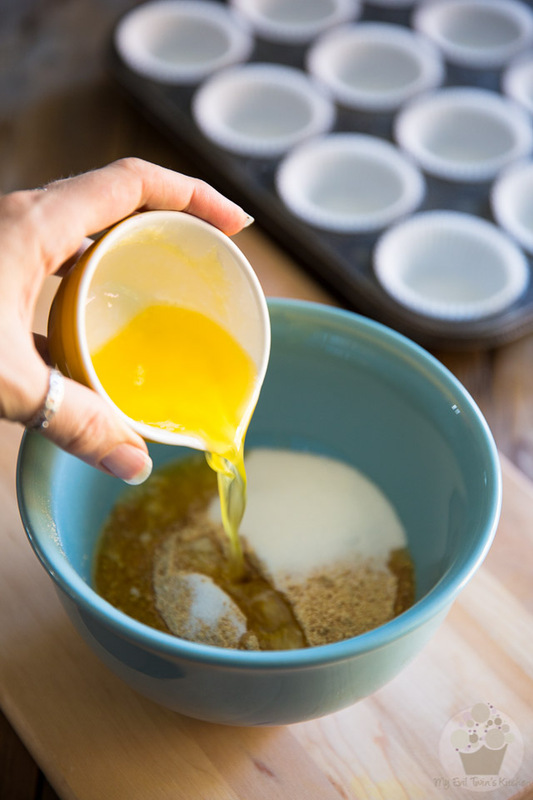 Divide this mixture equally between 12 paper lined muffin cups and then, with a small glass or flat object that’s roughly the same size as the bottom of the muffin cups, press the mixture down firmly to form a crust. Set aside. 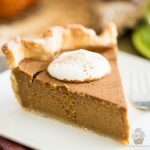 Like I said before, you could replace this graham cracker crust with round cookies, if you wanted to… I think golden Oreos would work fantastic! Next, combine all the ingredients for the cheese filling, except for the blueberry jam, in the bowl of your food processor. 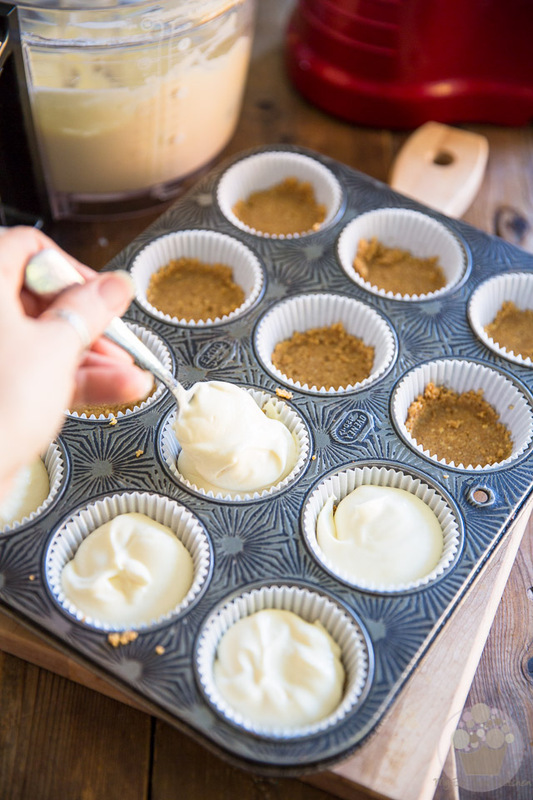 Process until the mixture is super smooth and creamy and completely lump free, about 2 minutes. Stop the motor to scrape the sides once or twice, as needed, to make sure that every last bit gets incorporated. 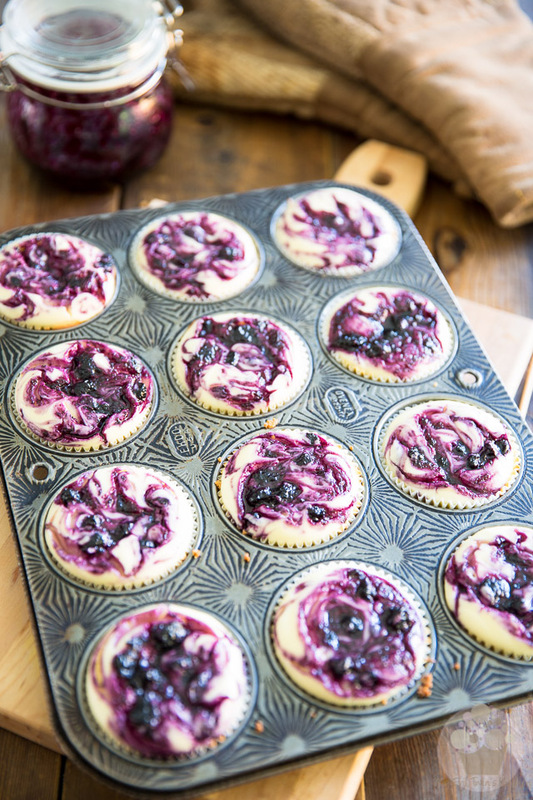 Divide this mixture equally between the prepared muffin cups, filling each cup pretty much all the way to the top. 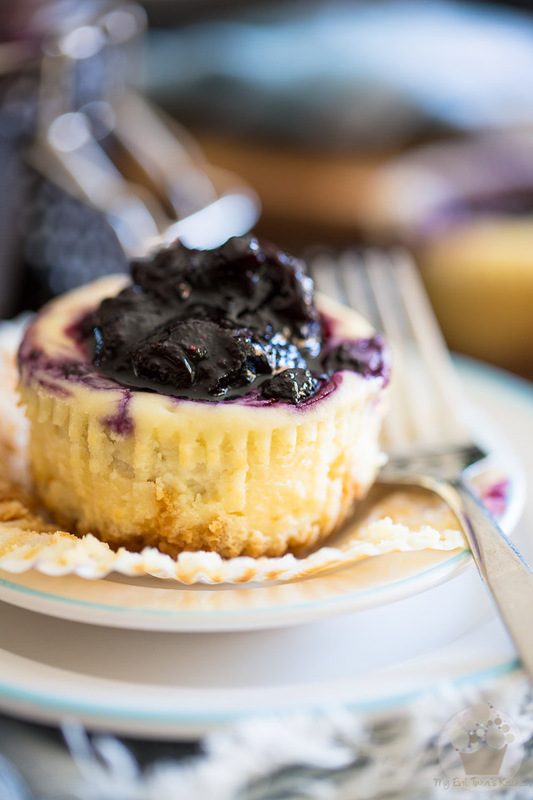 Now make a small well in the center of each cake with a spoon and drop about a teaspoon of blueberry jam over each cake. Of course, if blueberry jam isn’t your thing, you could very well use raspberry jam instead. That would work just as well! Then, with the help of a wooden skewer, delicately mix the blueberry jam into the cheese filling, making little swirls as you go. 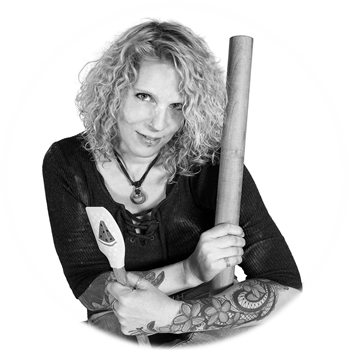 Stay near the surface and whatever you do, do not go all the way to the bottom with that skewer or you might end up damaging the crust. 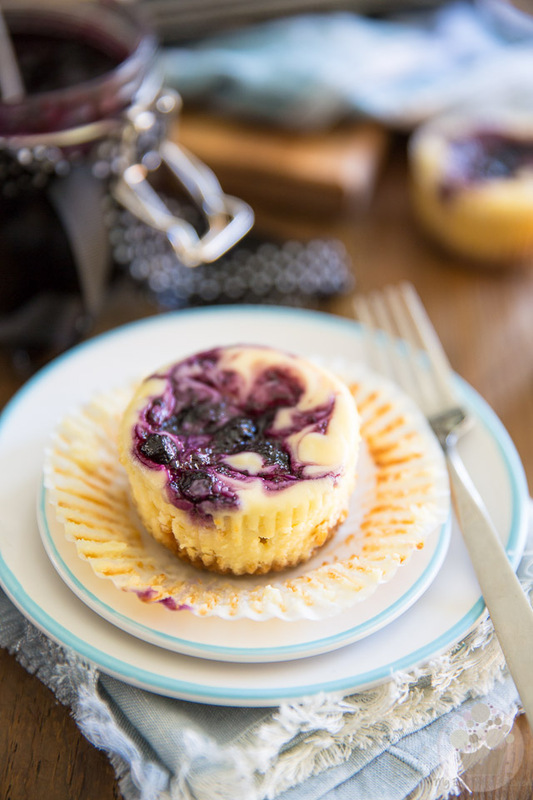 Bake the mini cheesecakes for 20 minutes, or until the tops start to get slightly colored and the edges start to set but the centers remain a little jiggly. Do not over-bake, otherwise your cakes will be dry. Remove from oven and allow to cool 1 hour, then cover loosely with plastic wrap and refrigerate for at least 2 hours before serving. If you really, really can’t wait, you could send them to the freezer instead, for oh, say… 3o minutes, maybe? And there you have it… delicious, creamy, silky cheesecake made entirely from scratch, ready in just a few hours. It doesn’t get much better than this, does it? Leftover cakes (if any) will keep in the refrigerator for about 10 days, or in the freezer for up to a few months. Preheat oven to 350°F. In a mixing bowl, combine the graham cracker crumbs and sugar and then pour in melted butter and stir until well combined. Divide equally between 12 paper lined muffin cups and then, with a small glass or flat object that's roughly the same size as the bottom of the muffin cup, press the mixture down firmly to form a crust. Set aside. 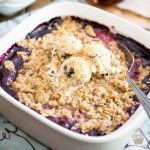 Combine all the ingredients for the cheese filling, except for the blueberry jam, in the bowl of your food processor and process until the mixture is super smooth and creamy and completely lump free, about 2 minutes. Stop the motor to scrape the sides once or twice, as needed, to make sure that every last bit gets incorporated. 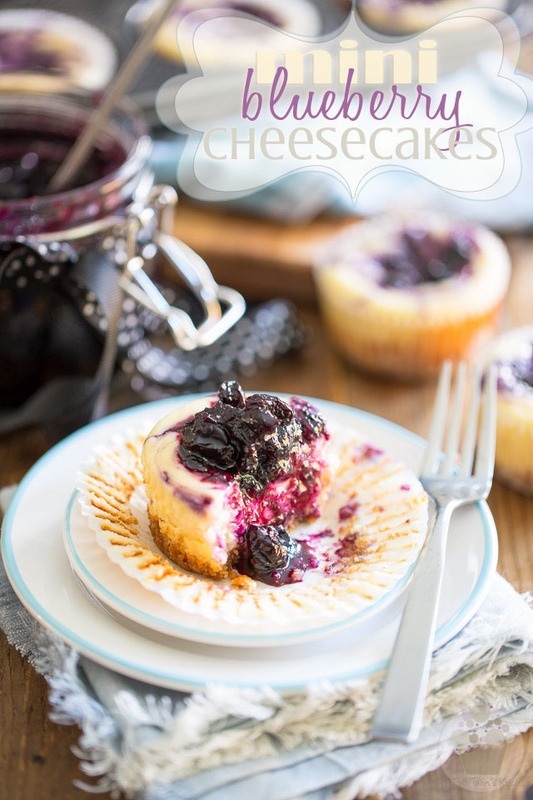 Make a small well in the center of each cake with a spoon and drop about a teaspoon of blueberry jam over each cake. 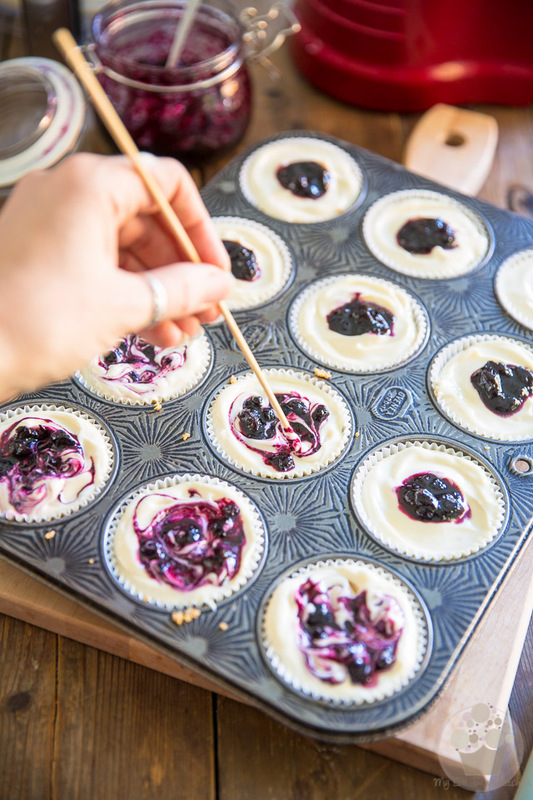 Then, with the help of a wooden skewer, delicately mix the blueberry jam into the cheese filling, making little swirls as you go. Do not go all the way to the bottom with that skewer or you might end up damaging the crust. Bake for 20 minutes, or until the tops start to get slightly colored, edges start to set but centers remain a little jiggly. Do not overbake, otherwise your cakes will be dry. Remove from oven and allow to cool 1 hour, then cover loosely with plastic wrap and refrigerate for at least 2 hours before serving. 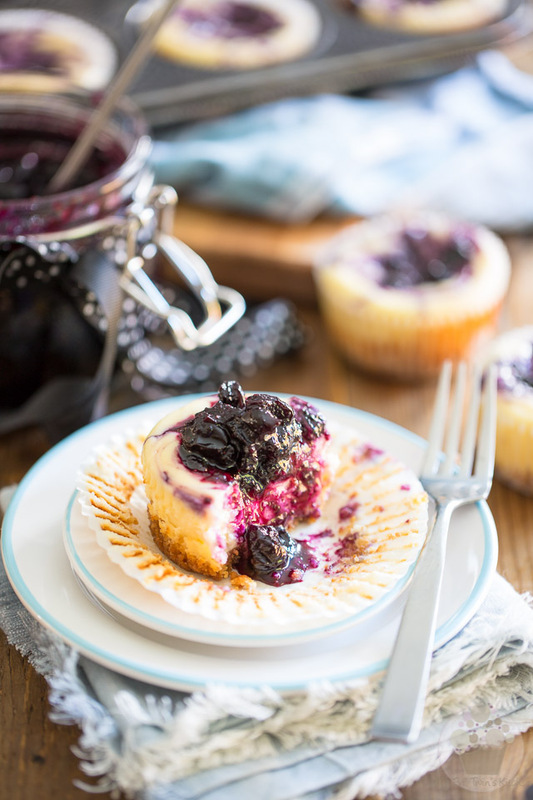 Serve chilled, topped with an extra spoonful of blueberry jam. 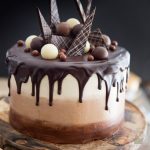 Leftover cakes will keep in the refrigerator for about 10 days, or in the freezer for up to a few months. Sonia you can’t do this to me! Making cheesecake quicker to bake is doing no favors for my waiste line lol. But I ain’t mad at it 😉 I foresee so many opportunities with this recipe. Instead of blueberry jam perhaps a nice pumpkin butter…? Hmmm. This could be fun..
Hey there! I baked the mini cakes exactly pulling them out at 20 mins but they had cracks on the tops, what am I doing wrong? There are many reasons that could cause a cheesecake to crack, so it’s kinda hard to tell exactly what went wrong. Did you follow the recipe and instructions exactly as written? Yes! I just pulled them out of the refrigerator and tried them with some blueberry preserve and they’re actually perfect! I might take them out at 18 mins next time. Will def be making them again. Thanks!! Hi there, I made these this past Sunday and I had a big problem with the cheesecakes falling. Any tips? What do you mean, falling? It’s hard for me to pinpoint the exact reason why this happened without knowing exactly what you did… The main reasons why cheesecakes will sink in the middle would be incorporating too much air in the batter (that’s why I always use a food processor as opposed to a mixer), under-baking (perhaps your oven is running a tad cold?) or sudden changes in temperature. It’s important to let them cool to room temperature before to put them in the fridge, or you could even leave them in the oven with the door ajar for about an hour after you turned the oven off, then put them on the counter to cool to room temp before transferring to fridge. Also too, if you slightly overdid it with the blueberry jam, this could have been the culprit. Hi! Thank you for your reply. I made these a second time on Friday and had success- no sinking! I mixed everything together then beat the eggs in slowly one at a time as my last step. I also used a water bath to even out the temperature and then left the oven ajar for two minutes when they finished baking. They turned out lovely. 🙂 thanks! I am not the best baker..so my question is about the heavy cream? Do i whip it up first, to get it fluffy- then pour it in with the rest of the ingredients as instructed? Or, do i just pour the heavy cream as its liquid form.